GEORGE STEPHANOPOULOS: You raised some eyebrows yesterday with comments you made at your latest rally. I want to show them, relating to 9/11. This exchange demonstrates the folly of trying to fact-check Donald Trump. Even when confronted with contrary information — “police say it didn’t happen” — he insists that with his own eyes he saw “thousands and thousands” of cheering Arabs in New Jersey celebrating as the World Trade Center collapsed during the Sept. 11 attacks. 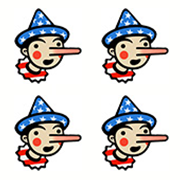 Trump has already earned more Four-Pinocchio ratings than any other candidate this year. He is about to earn another one. Since Trump on ABC News suggested that celebrations might have happened elsewhere in New Jersey, we also contacted Jerry Speziale, the police commissioner of Paterson, which has the second-largest Muslim population in the United States — numbering nearly 30,000. He minced few words, even using a barnyard epithet, while giving his response. Of course, “a number of people” obviously does not equal “thousands” — and “allegedly” indicates there is no video footage or other proof that celebrations actually took place. Recall that Trump claimed he saw this on television — and that it was “well covered at the time.” This newspaper article appeared days later. As you can see, this is not in New Jersey. No one disputes that there were some scenes of celebration overseas. A former aide to a New Jersey senator at the time wrote The Fact Checker to say most letters the office received concerning alleged celebrations by Muslims were traced to this particular clip. We also heard from some readers who claim to have heard this story from neighbors or friends or, in a handful of cases, said they personally saw some some people celebrating. (Matthew H. Rudd, an attorney, said he left the courthouse in Paterson midday three days after the attacks and saw “half a dozen cars full of young Arabic-looking men drove by blaring Arabic music and cheering loudly. I do not have any recordings or photos, but I can tell you that it was a very disturbing and unsettling sight.”) These accounts are of course only anecdotal, do not involve thousands of people and were not filmed. In the case of Rudd’s description, this did not take place on 9/11 but a few days later. But Walter Zalisko, a former police officer in Jersey City, contacted The Fact Checker to say Farmer was wrong. He says he heard on the radio dispatch at the time that officers had found Middle Easterners “clapping and laughing” on a number of rooftops, even in one case knocking down a cardboard version of the Twin Towers. But he does not think a police report was filed. “It was at most a hundred people doing this,” he said, saying Trump’s description of “thousands and thousands” was an exaggeration. As for Farmer’s account, Zalisko said: “John was holed up in his office and he didn’t know what was going on.” But Zalisko did not personally witness any of this. Farmer expanded on his version of events–a firm nothing happened–in an opinion article for the Newark Star-Ledger. Update, Dec. 2: The Trump campaign posted snippets of video clips from a local CBS New York City newscast at the time that reported on the arrest of “eight men”–not “thousands and thousands”– who were reported by neighbors as having celebrated the attack. One snippet mentions they had a model of the Twin Towers, as Zalisko had recalled. But while the newscast quotes an investigator as allegedly saying these men knew about the attack in advance, it is unclear if any charges were ever brought–or if the claims of celebrations were ever proven. As Farmer said, investigators looked into many such reports–and found them to be groundless. So this appears to be yet another unconfirmed report. @cindymannings @WCBSTV @DanScavino @NolteNC @GlennKesslerWP Report says investigators believed building "swarmed" with Rahman suspects. Note: We originally linked to a conspiracy Web site about the MTV claim but then updated with a direct link to Schlussel’s column. She objected to the suggestion she is conspiracy-minded and on Nov. 23 posted an update citing some examples of Muslims in the United States applauding the attacks, such as four Ford factory workers in Dearborn, Mich.
“MTV did do a story on it,” she wrote in an e-mail. “I’m not saying MTV is the most credible source in the world, but it is a liberal source.” She says she no longer has a copy of an MTV broadcast, and it cannot be found online. “It’s strange that there is no record of it online, but as I always say, just because it is not online, doesn’t mean it didn’t happen.” We asked MTV and Viacom, owner of MTV, for comment. Update, Nov. 26: MTV found the video and posted an excerpt on YouTube. This further undercuts Trump’s case (and Schlussel’s). One person, a then-high school senior named Emily Acevedo, was quoted as saying she had seen a group of kids acting up in front of the Paterson courthouse, banging on trash cans and shouting. She does not say they were Middle Eastern or Arab. Her recollections are intercut with comments from others, including a reporter on a newscast, saying nothing happened. MTV News interviewed Acevedo 14 years later and she said what she “saw that night [was] not anything any different than would’ve happened on any other summer night, on any other day where school was let out early.” So this demonstrates once again there is no evidence of mass demonstrations. At best, there were only some kids acting up–who may or may not have been Arab. This appears to be another case of Trump’s overactive imagination, much like his baseless claim that the George W. Bush White House tried to “silence” his Iraq war opposition in 2003. We looked and looked — and could find absolutely no evidence to support his claim. But that was merely a matter of self-aggrandizement, whereas now Trump has defamed the Muslim communities of New Jersey. He cannot simply assert something so damning; he must provide some real evidence or else issue an apology. Update: Despite Trump’s efforts to throw up a lot of smoke, such as snippets from news clips, he continues to fail to demonstrate that his claim that he saw “thousands and thousands” of Muslims cheering on TV has any basis in reality. The Four Pinocchios continue to stand. "I watched in Jersey City, New Jersey, where thousands and thousands of people were cheering as that building [World Trade Center] was coming down." in an interview on ABC News’s "This Week"